Autoroutes are at the heart of the French road network. Autoroutes are the French equivalent of motorways, but rather than being owned by the government and paid for by taxes, are owned by different companies, who charge vehicles a toll. If you are going on a long journey you can expect to pay a number of tolls. While most autoroutes are toll roads, a few are free, particularly in the Brittany region where most of the autoroutes still belong to the government. The speed limit on a French motorway for a car is 80mph (130 km/h) in dry conditions, changing to 68mph (110 km/h) when wet. Toll autoroutes are signalled with the word péage (meaning ‘toll’, and pronounced pay-arje) and a blue sign, whereas free roads have a green sign. The procedure for using toll motorways is to take a ticket upon joining the autoroute, and produce it again when leaving the motorway. Payment is calculated according to the distance travelled. Prices vary depending on the route taken and the type of vehicle. It is important not to lose the ticket, as if you cannot produce your ticket when exiting you will be charged the maximum fee for that stretch of road. Some toll roads do not require you to take a ticket, as there is a fixed tariff to pay when you reach the end. Autoroutes can be paid for by cash or credit card, or, if you’re planning to spend a lot of time on the roads, you could invest in an electronic Télépéage badge. The badge can be placed on the dashboard or windscreen, and will automatically raise the barrier without the need to lean over to the left window. It keeps a record of all journeys then bills you at the end of your holiday. Emovis Tag UK have recently set up a new operation in the UK that allows UK residents to pay for a Liber-t tag from a UK bank account. 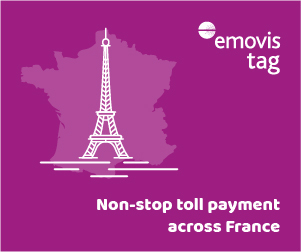 More information is available from Emovis Tag UK, the UK representatives of French autoroutes - click here for more information. Tolls are subject to change so it’s wise to check just before you leave, or make sure you’re carrying extra cash when driving through France, just in case. And don’t forget that different vehicles pay different prices. Click here for autoroutes key rates . The autoroutes website also has a handy interactive key rates tool, which allows you to input your departure and arrival destination along with the vehicle type, to quickly and easily find out the price of your journey. The website also shows real time traffic updates, so it is really worth checking online before you travel. There are resting areas with car parks and public toilets every 10km along autoroutes, to enable you to stop and take a break. Every 40km there are bigger resting areas which have a restaurant, picnic area and a petrol station. On heavy traffic days, such as in school holidays there are sometimes organised recreation events at rest areas. On more recently built motorways these distances are longer. Similarly to in the UK, there are emergency call boxes every 2km on each side of the motorway. These allow you to call for help, and the emergency services will be able to locate the call. Some call boxes have a flashing light that will warn of a problem ahead. If you break down on the motorway, as well as your European breakdown cover insurer, you must also notify the police. Garages will not come to recover you on the motorway without permission from the police. Before travelling, it is worth checking for planned road closures and road works, as this can save a lot of time and frustration!